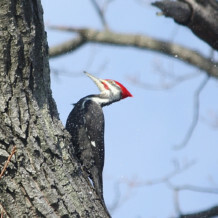 Join Friends of Glen Providence Park in our third year participating in the Christmas Bird Count, the world’s longest-running Citizen Science survey! The CBC was started on Christmas Day 1900 by the Audubon Society, in reaction to the tradition known as the Christmas “Side Hunt”: whoever brought in the biggest pile of feathered (and furred) quarry won. Instead of hunting birds, the CBC would count them! In this early-winter bird census, thousands of volunteers across the US, Canada, and many countries in the Western Hemisphere go out over a 24 hour period to count birds. Researchers and conservation biologists use the data to study the long-term health and status of bird populations across North America. It’s a wonderful way to slow down for a morning and take a break from the holiday rush. You can read our reports from the 2011 CBC and 2012 CBC. Join us this year! – Experienced and novice birdwatchers welcome, just remember this is an official census so we will be working- if you can call walking in the park and admiring wildlife working! – Of course, bring your binoculars and bird guides! Friends of Glen Providence Park will submit our results to the CBC Compiler for Delaware County. We will also post the results on our website!